At Northern Strands, we take safety seriously. It is important to learn how to properly use a Tow Strap or Tow Rope to help move a piece of heavy equipment, combine, truck, or any other type of vehicle that is stuck. 1. 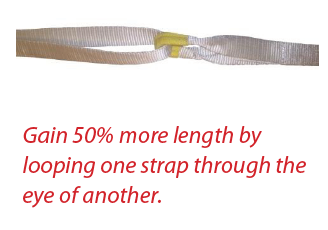 Recovery straps should be at least 6 m or 20 ft in length, with loops (not hooks), and in good working condition (no cuts or broken stitches). 2. Check both vehicle weights and add the weights of any loads either vehicle is carrying. The vehicle doing the pulling must be equal to, or ideally, greater weight than the vehicle that is being pulled. 3. Ensure the tow strap has a Minimum Breaking Strength (MBS) that is 2-3 times the total weight of the stuck vehicle. If it is less, the strap may snap under high tension. If it is more, the strap will not function properly. 4. Ensure tow hooks, hitch receivers, and any shackles used are rated to the loads that exceed the recovery strap MBS. In the event of excessive loads, the recovery strap should always be the weakest link and snap first. 5. Move away as much mud, sand, or snow from under the vehicle and in front of the tires in the direction of the pull. 6. Position the pulling vehicle in line with the stuck vehicle - the pulling vehicle facing forward and the stuck vehicle being pulled from the front or the back. Ensure that you are within 10 degrees of a straight line - side loading can lead to serious vehicle damage. 7. Lay out the recovery strap between the two vehicles and loop the strap onto a hook bolted to the vehicle frame or put the loop on a shackle that is properly pinned to a frame mounted hitch rated for recovery. If using a threaded shackle, hand tighten the pin and then turn it back one quarter turn for ease of release later. Never tie the strap onto the vehicle. Slip the strap over a ball hitch, or attach it to anything other than a tow hook or frame mounted hitch. 8. Drape a heavy coat or blanket over the middle of the strap to dampen any backlash if it snaps or releases. 9. Ensure all bystanders are at least 2 times the length of the tow strap to the side of the vehicles. 10. The pulling vehicle accelerates slowly (to about 10-12 KPH) to build tension in the strap and provide a sustained pull. Once the slack is taken up, the stuck vehicle likewise applies acceleration in low gear to assist the pulling car. Neither vehicle should spin their tires. Steady momentum is most effective. 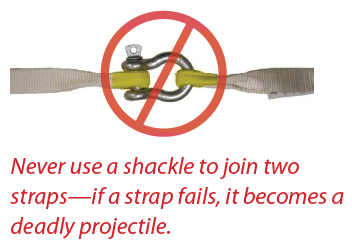 Maintain tension throughout the pull, do not allow slack to develop in the strap at any point. 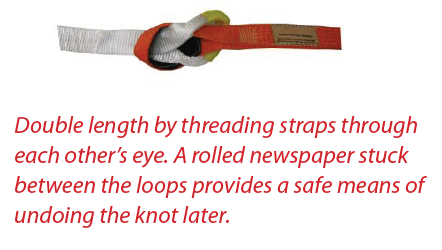 Northern Strands Tow Strap & Tow Ropes are priced 30% less than our competitors! We stock all common sizes of Tow Straps and custom sizes are available upon request. Contact us today for more information! Wholesale Pricing on Tow Straps and Tow Ropes Sold at Northern Strands. Up to 30% Lower Cost Than Competitors!